Our passion for making genuine quality machines started when the founders of Svetruck developed their first forklifts in the sixties. This passion is still very much alive. Now and in the future, Svetruck will continue to develop new machines by combining modern technology and genuine knowledge. We build our machines to the highest standards, not to the lowest price – we are always focused on quality. 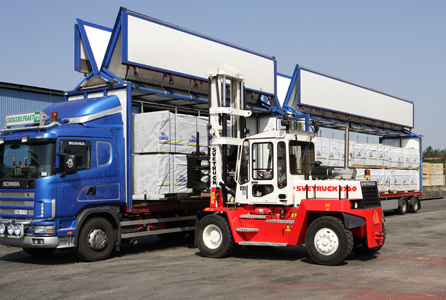 When talking about forklifts and efficient material handling, which includes heavy lifts, one speaks much about quality. When we speak about material handling we mean a complete concept in which the forklift plays a very important part of the process. The continuous co-operation between Svetruck and our customers builds a long term relationship and is the foundation for a quality product. Svetruck's smallest range of forklifts is suitable for sawmills, house factories, stone and concrete industries. We have a wide range of liftmasts and fork carriages for different applications etc, suitable for Svetruck 10-14 tons. A good workplace that guarantee the operator a good day at work. We have designed our cabins with operators in mind. The diffi­culty is not building a multifunctional workplace, but adapting it to the person using the forklift. This task is always given top priority. Our cabin is a perfect workplace combining hi-tech features and ergonomics. The cabin is a comfortable and safe workplace that reduces stress and strain for the operator whilst at work. The largest possible window area ensures excellent visibility of the work area, forks, attachments, yoke and the load itself. Additional windows placed low down in the doors gives the operator an excellent view of the available working width. All instruments, controls and warning lights are always visible. This guarantees ­precise and rapid working procedures which minimise the risk for accidents. A heater and air-conditioning function with recirculation helps maintaining the perfect cabin climate. The rear window is designed to protect against heat, cold and noise. The cabin can be tilted hydraulically for easy maintainance. We also offer a wide range of accessories. Svetruck’s operator cabin meets operators current and future requirements and demands. Our delivery program includes bale clamps, paper-roll clamps, rotators, coilrams, reel clamps etc.